West Bend insures a wide variety of health, beauty, and fitness businesses such as health clubs, beauty salons of all types, barber shops, yoga studios … and so many more. Your clients come to you when they’ve decided to take control of their health and well-being. One of the most important things you do each day is make sure they have a safe and enjoyable workout experience. But it’s just as important to make sure your business is properly protected so you’re equipped to handle unexpected situations that may cause damage to your property or injury to your valued customers. Because your business is unique, it deserves special attention. It’s important to choose a company that understands your needs and can provide the proper coverages for your health club operation. West Bend is dedicated to providing you with an affordable insurance product designed especially for your needs. Coverages are designed specifically for health clubs and circuit workout-type businesses. If a client is injured or your property is damaged, you’ll need an experienced team of claim professionals who will be dedicated to handling your loss. 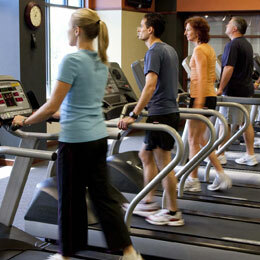 West Bend provides protection for thousands of personal trainers, health clubs, and circuit workout facilities. Our customized Yoga Studio Program can provide protection for all types of yoga styles and arts including Bikram Yoga. General Liability. Operating a business like yours isn’t always easy. Sometimes situations occur that can result in a claim ... a customer slips on a wet floor and is injured, an ad placed in your local newspaper unintentionally offends someone, or an employee gives improper advice during a yoga session. If that happens, we’ll be there for you. Professional Liability is included for most accounts. Property Coverage. You’ve invested in yoga equipment and studio supplies; maybe you’ve purchased your own building. Protect those investments with the right coverage at the right price. In addition to a variety of property coverages, West Bend offers the Platinum Pak which provides additional protection, including coverage for personal computers and employee theft. Other Critical Coverages. Talk to your independent agent to find out what other valuable coverages you may need. Based on your needs, your agent may recommend higher liability limits in an Umbrella policy, Inland Marine for equipment, Employment Practices Liability Insurance, or other essential coverages. One of the most important things you do each day is make sure your clients look and feel good. But it’s just as important to make sure your business is properly protected so you’re equipped to handle unexpected situations that may cause damage or injury to your property or to your customers. West Bend understands and recognizes your business insurance needs. If a client is injured or your property sustains damage, you need an experienced claims team dedicated to handling your loss. Selecting the proper coverages for your state-licensed or certified personal appearance-related business is important. That’s why West Bend is dedicated to providing you with an affordable insurance product designed especially for your unique needs. West Bend’s insurance program is designed for tanning salon operations. Because your business is unique, it deserves specialized attention. It’s important to choose a company that understands your needs and can provide the proper coverages for your tanning salon operation. West Bend is dedicated to providing you with an affordable insurance product designed especially for your needs. If a client is injured or your property is damaged, you’ll need an experienced team of claim professionals who will be dedicated to handling your loss. West Bend provides protection for thousands of tanning salons throughout the Midwest. Our customized Tanning Salon Program is designed with specialty coverages for sun tanning salons, including spray-on and air-brush tanning. General Liability. Operating a business like yours isn’t always easy. Sometimes situations occur that can result in a claim … a customer slips getting out of a bed and is injured, an ad placed in your local newspaper unintentionally offends someone, or an employee gives improper advice and a client is burned. If that happens, we’ll be there to defend you. Professional Liability is included at no additional cost to you. Property Coverage. You’ve invested in expensive equipment; maybe you’ve purchased your own building. Protect those investments with the right coverage at the right price. In addition to a variety of property coverages, West Bend offers the Platinum Pak which provides additional protection, including coverage for utility services direct damage in the event that lightning surges all or several of your tanning beds. Other Critical Coverages. Talk to your independent agent to find out what other valuable coverages you may need. Based on your needs, your agent may recommend higher liability limits in an Umbrella policy, Employment Practices Liability, or other essential coverages. To design an insurance program that's right for your health, beauty, or fitness business, be sure to talk to an independent insurance agent in your area who represents West Bend.